Pat has been serving the Chicago area and suburbs for over 30 years. He has tuned for most major venues in Chicago, as well as many world famous recording artists. His concert tuning experience helps teachers, local businesses, and individuals achieve fine quality sound. Pat is also qualified to repair pianos. After rebuilding dozens of pianos, his knowledge of the instrument's parts helps him fix and prevent technical problems while on the job. 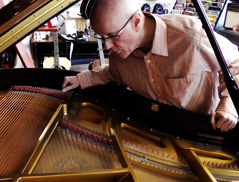 Every piano is different, and Pat's knowledge of the instrument's interior will help him address your unique tuning needs. Some tuners use all electronic equipment. Modern equipment can assist in tuning, but the ear is the ultimate judge. After 30 years of tuning, Pat is thoroughly familiar with the piano's intricacies. His unique combination of traditional experience and sophisticated pitch-raising software will bring out your piano's best. Pat has dared recording studios to pick out superior tuning. In blind tests between Pat's tuning and other tuners', sound engineers always picked Pat's work as superior. Pat would tune a piano, have the studio play and record, and then another tuner would do the same a few days later. Studios preferred hearing Pat's sound on their recorded CDs. I would tune a piano for a recording studio, and they would record it. Then wait a few days and have someone else tune the piano and record it. In a blind comparison between the two tunings, the engineers would always pick out my tuning as the superior tuning. It excited them, and they would prefer it to be heard on a hit song being played on the radio. My tuning sparkled. The other tuning didn't. This is the quality of tuning I have to offer you.